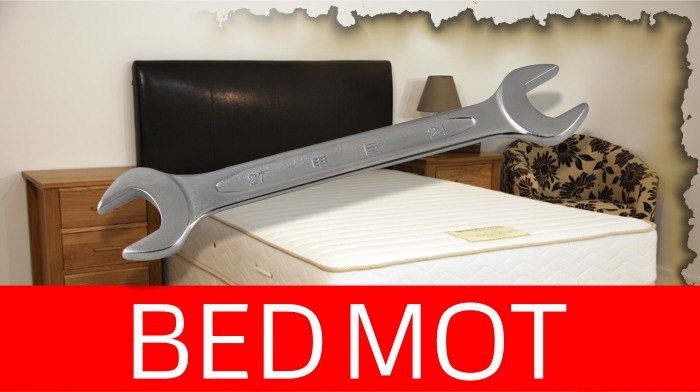 Does Your Bed Pass Our MOT? Can't remember when you bought your bed? Unsure whether it needs changing? Why not complete Our Bed MOT check. Simply answer the questions below and we'll tell you. Please bear in mind that the answers are neither right or wrong, they are simply to determine how bad your current mattress may be! Is it seven or eight years old or more? The critical 'Seven year itch' can be a make or break moment for many marriages and mattresses. Did you have a better nights sleep somewhere else?? Such as a hotel or a friends spare bedroom? Do you disturb your partner or are you disturbed by them when changing sleep positions? Does it look used or worn? Is it sagging - do you and your partner roll towards each other unintentionally in the middle of the night? Are the base, legs or castors lumpy, worn or wobbly? Your Current Mattress is just fine for now! Your Mattress is probably fine for now, but keep an eye on it! Your mattress is well on the way to needing replaced! We would say your current Mattress needs replaced! 100% Time for a New Mattress, no Ifs or Buts!